Growing up Ashley Hayward was told that she could do anything. It was a positive message, but an overwhelming one as well, with enough options and opportunities to get lost in. She knew she had to find something that fit with her values. That’s how she found herself at CMU’s Menno Simons College (MSC), majoring in Conflict Resolution Studies. As a working mother and a full-time student, Hayward also knows the value of practicality. That’s what appealed to her about attending the 2017 Canadian School of Peacebuilding. Hayward had just completed the Honours thesis for her undergraduate studies at MSC on how language shapes conflict and figured that studying at the CSOP would be a good bridge to her master’s training. 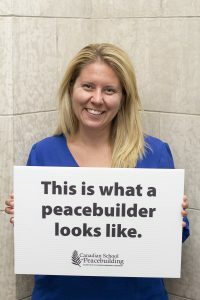 In her first week at the CSOP, Hayward took Journalism and Peacebuilding. She loved it. In her second week at the CSOP, Hayward—who is Métis—took Human Rights and Indigenous Legal Traditions. She says she’s only just beginning to get to know her Indigenous heritage, and the course has helped her to do that. Hayward adds that studying with people from a variety of backgrounds was a highlight of her CSOP experience. “The international perspectives around the table and the actual experience from people around the world, from different walks of life, different parts of their careers, gave a different reference point for us,” she says. Hayward is now a student in the Joint Master of Arts Program in Peace and Conflict Studies at the University of Manitoba and the University of Winnipeg. She is the first person in her family to graduate from university.